How Far Does Your Love Go? Oh, About 29% Farther. How can I not love Southwest Airlines? I'm A-List Preferred, which means I get free internet usage on the plane. They give me a Companion Pass allowing my wife to fly free with me. I have Priority Boarding, so I usually get my pick of the litter when it comes to seats. Priority Check-In allows me to pass right by many of those poor non-preferreds and go practically right to the front of the security line. They have the friendliest staff, extremely flexible policies for rescheduling flights, free peanuts and sodas ... even free checked bags! 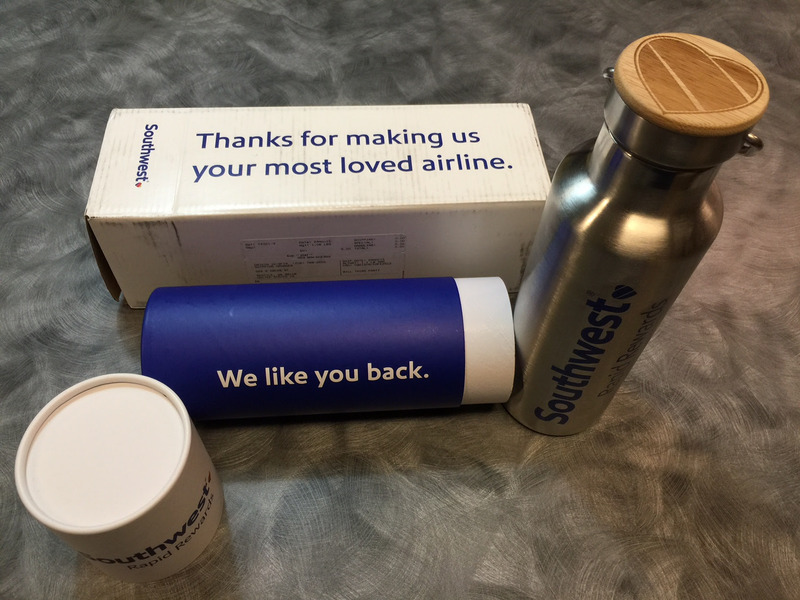 Then, to top it all off, as a thank you for my loyalty and their 10 years of service to the Denver airport, they sent me this really neat hot/cold canister. How did they know that I'm in constant need of one of these things?! HOW did they know? Never have I felt so loved. But after last week, neither have I felt ... so torn. Let me explain. As I was planning flights, I first headed to my beloved Southwest.com, plugged in my optimal flight dates and times, and viewed the results. Gulp! It was showing $650 for my roundtrip flight. I realize it's the holidays, but come on, I?m zipping in and zipping out. $650? Really? Well, before I bit the bullet and clicked "CONTINUE," I decided it would only be prudent to check out one more airline, so I headed over to Frontier?s website. Again, I plugged in my dates and times, and boom ? $9 out and $165 back! I couldn?t believe it. I thought something MUST be up ... and then I was reminded of the the famous Frontier "catch." They charge for bags. They charge for better seats. They charge for refunds. They charge for carry-ons. They charge for checked bags.This was exactly what all my friends had complained about with Frontier. And now I was jumping on the same bandwagon. "Of course," I thought. "Add all of those things up, and Southwest is CERTAINLY the better deal. I gotcha this time, Frontier!" And watched as my love for Southwest slipped through my fingers. You see, Frontier does offer "The Works," a discounted package that provides all of those extras. In this case, it was about $100 more. So the round trip flight, The Works, and taxes ... all together ... added up to $340. It was a far cry from the $650 Southwest was showing. But how was I going to walk by those friendly Southwest folks as I headed to the Frontier gate? How could I let those people of "preference" pass by me as I waited in the regular-guy line. How could I tell my wife that she may not fly free with me next time (which happens about once every two years)? Was I going to miss the peanuts? I decided the savings was worth switching to Frontier this time ... but it wasn't without some calculated deliberation. If Southwest had been $200 more, I still would have chosen Frontier. But had it been only $100 more (that's 29% more than Frontier's rate), I think I would have stayed with Southwest. The consistent delivery of their service, the friendliness of their staff and the few perks Frontier doesn't offer add an intangible value that's hard to beat. Some might refer to it as brand equity. Here, I?ll just call it love. So how does a company reach that level of love? A reliable product or service is critical. Trust (and value) is built when a positive experience is consistent over a number of brand interactions. Be consistent. Always. When things do go wrong, be sure to over deliver on the "make good." Southwest has done this with me a number of times. Consider the "perks" that come with your product or service. The more unique they are, the better your opportunities are to truly differentiate, add value and increase "love."